House lawmakers are currently pushing a resolution to classify the newly formed Palestinian unity government as a foreign terrorist organization and cut off U.S. aid following the formation of a new ruling body that includes the terror group Hamas, according to a copy of the draft resolution obtained by the Washington Free Beacon. The new resolution, sponsored by Reps. Michele Bachmann (R., Minn.) and Trent Franks (R., Ariz.), calls on the State Department to designate the Palestinian Authority (PA) and its new Hamas-backed unity government as a terrorist organization. The resolution is expected to be introduced Monday. It additionally calls for the Palestinian Liberation Organization (PLO) to be reclassified as a terror group and for the U.S. government to fully cut aid to the Palestinians, who have received around $5 billion in bilateral assistance since the 1990s. 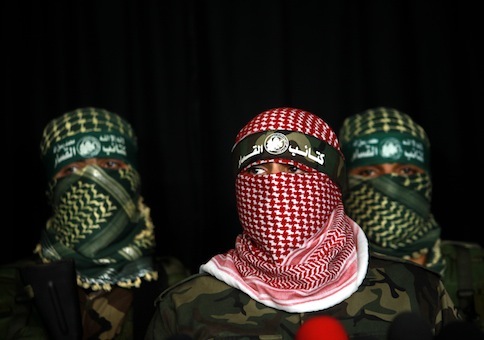 "The Palestinian Authority has shown its true colors by forming a unity government with the terrorist organization Hamas," Bachmann told the Free Beacon. "This nightmare scenario for the peace process means that Congress must reassert its constitutional authority and suspend foreign aid to the PA. We cannot continue to assist our enemies at the expense of our ally, Israel." U.S. lawmakers and Israeli officials have expressed shock in recent days that the Obama administration is willing to work with the new Palestinian unity government, which united the ruling Fatah party with the Hamas terrorist group that runs the Gaza Strip. Lawmakers on both sides of the aisle maintain that the unity deal violates a U.S. law banning taxpayer dollars from being sent to any Palestinian government that includes Hamas, a designated terrorist organization. However, the Obama administration has sought to exploit loopholes in the law and announced in recent days that it is willing to work with the new Hamas-backed government, despite Israeli objections. The new congressional resolution maintains that there should be consequences for these moves and pushes for the PA to quickly dissolve the new government and outlaw Hamas. "Since Hamas and Fatah have now unified, Congress must reassess our foreign aid and support to the Palestinian Authority (PA), as foreign assistance runs in direct contravention to current law in regards to a unity government," the lawmakers wrote in a letter to fellow lawmakers urging them to support the resolution. The resolution explicitly urges the State Department to classify the new government as a terrorist entity, which would effectively block financial transactions with it and cut it off from the international community. "Since Hamas and Fatah have unified, regardless of it being made up of technocrats from Hamas and Fatah, the secretary of state should designate the Palestinian Authority and such unity government as a foreign terrorist organization, and redesignate the Palestinian Liberation Organization (PLO) as a foreign terrorist organization," according to the draft language. The resolution additionally criticizes Palestinian President Mahmoud Abbas for harming U.S. efforts to forge a peace deal by unilaterally pursuing statehood at the United Nations and condoning "anti-Israel incitement," according to draft text of the measure. It also takes aim at Abbas and the PA for "rampant corruption" that includes paying salaries and "other forms of compensation" to imprisoned terrorists and their families. "The Palestinian Authority’s highly advertised terrorist salary program incentivizes killings and bombings against innocent civilians, which includes the murder of at least 54 United States citizens since 1993 and more than 83 injured," the resolution states. Lawmakers and experts have maintained that the Obama administration is violating U.S. law by continuing to fund the PA and its unity government. The 2006 Palestinian Anti-Terrorism Act explicitly states that no U.S. aid can flow to a Palestinian power sharing government that includes Hamas or any members of the terror group. The law further bans aid to any government in which Hamas is given "undue influence" over political decisions. Aid to such a unity government would be contingent on all parties recognizing Israel’s right to exist as a Jewish state and accepting all past agreements inked with Israel. However, Hamas has vowed to continue its armed resistance against Israel and has refused to renounce terrorism against Israel. The White House’s decision to work with the new Hamas-backed Palestinian government sparked a new row with the Israeli government, which publicly expressed outrage with Washington. It was further reported this week that the Obama administration has been secretly speaking with Hamas for the past several months and may have even suggested ways it can participate in a unity government without triggering a cut in aid. The American Israeli Public Affairs Committee (AIPAC), the nation’s top pro-Israel lobbying group, announced late Thursday that it is backing a cutoff in aid to the PA.
AIPAC, which was initially hesitant to publicly push for a cut in aid, stated in a memo that the "unity government backed by Hamas is a disturbing setback for peace." "Congress should suspend aid to the PA while it conducts a thorough review of continued U.S. assistance to ensure that U.S. law, which prohibits funds to a Palestinian government in which Hamas participates or has undue influence, is completely followed and implemented," AIPAC wrote. Capitol Hill insiders maintain that the Obama administration is violating the law and that Congress is prepared to crack down on the PA.
"The law here is crystal clear: we must limit aid to the Palestinian Authority should it formally associate itself with Hamas," said one senior House aide working on the issue. "However, the Obama administration is likely to dodge this requirement in order to keep its failed peace process on life support. Is the White House really prepared to defend sending taxpayer dollars to a government that includes a terrorist organization?" This entry was posted in National Security and tagged Hamas, Israel, Mahmoud Abbas, PLA, Terrorism. Bookmark the permalink.